NYCAviation on the Today Show! NYCAviation made its network television debut on the Today Show this morning, where we explained the hobby of aviation enthusiasm to the nation and showed Al Roker and Ann Curry a good time at JFK. 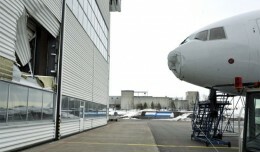 Beijing, Baku and Budapest have all been visited by Boeing's biggest bird, but before Wednesday, the Big Apple had not. AirTran Airways has unveiled a Boeing 737-700 adorned with large dolphins painted on the fuselage and engines in honor of the airline's longtime support of the Georgia Aquarium in Atlanta.